October Fifth is the day that the Royal Wudo College recruits students. Their requirements are high – the students must be around eighteen years old, and their Yuan Gu must not be lower than Level Five. The tuition fees are also expensive. Yuan Gu is one’s born ability to practice Wudo. The higher level one’s Yuan Gu is, the faster he will learn Wudo, and the higher level his Wudo will reach. Yuan Gu Level Five is considered talented, Level Seven and Level Eight can be called outstanding, and those that have Level Nine are considered legendary. The Royal Wudo College is one of the most famous Wudo colleges in the kingdom of Nan Ling. They recruit students every ten years. The Wudo levels of all graduates from this college are above Ning Zhi. The graduates from this college have very promising futures. Some family armies recruit their high-rank officers directly from these graduates. Nan Ling square was very crowded, tens of thousands of people gathered there to see the recruitment. Among them armored soldiers were also present maintaining the order. A group of people dressed in Wushu suits stood on the platform in the center of the square. Three middle-aged men were sitting at one side of the platform, a dozen young men stood behind them. On the platform, there also stood a milky white stone pillar as high as three meters, on which Ten Yuan Wen were carved. Beneath the platform, more than a thousand young people from each family are waiting. They were the students who wished to enroll today. They looked energetic and eager. Among them, dozens of young men dressed in white Wushu suits were also waiting. They were the followers of the Mu Family. Mu Feng was also among them. One boy from a family pointed at Mu Feng while exchanging whispers with his friends. Many young men and women were discussing him. Some sigh, but most of them talked about him sarcastically. People always tend to be jealous of a genius, so they satirize and step on the former Wudo genius to give them satisfaction. One loud voice echoed in the square and people stopped talking. The elders’ Wudo levels in this college have reached or exceeded the Yuan Dan level. All the young men and women were not surprised by his words, they all knew the rules. After that, a young man in a grey dress holding a registration form in his hand came forward. He then sat down beside the stone pillar and got ready. ‘The first family is Shang Guan.’ He said in a loud voice. People beneath the platform started to move. More than forty young boys of Shang Guan Family lined up on the platform. The first boy approached the stone pillar, he cut his palm with a dagger. The blood soon started to drip down. As soon as he put his red palm on the stone pillar, the blood was sucked into it, and the Yuan Wen carved on it started to light one by one. The stone pillar lighted eight Yuan Wen. The man with the register book said with jealousy. All the young men waiting under the platform looked at him full of jealous. Shang Guan Qian Zhi looked irritatingly smug, he looked down at Mu Feng and mouthed the word without making the sound. Mu Feng was angered by his smug face but did not say anything. ‘Hahaha….’ Shang Guan Qian Zhi left the stage, laughing loudly. The test was quick, all the men from Shang Guan family finished their tests in less than ten minutes. After a few families finished their tests, it was the turn for the Yun Family. There were about thirty young girls and boys from Yun family, and at the front of the line was Yun Wan Qing. Once Yun Wan Qing stood on the stage, the boys started to cheer and shout. She was a well-known beauty in the city. 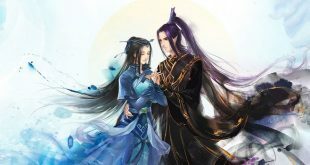 The love story between Mu Feng and her was also well-known. However, now the well-known love story has become a well-known gossip. She looked at Mu Feng with worries, but he returned her a very sunny and warm smile. She smiled back, she was happy to see his positiveness. She cut her finger and placed her hand on the stone pillar. The Yuan Wen started to light one by one, but after a few seconds, nine Yuan Wen lit up! People were astonished by what they saw. The three elders of the college all st00d up from their chairs. ‘Level Nine of Yuan Gu, a legendary one!’ They looked at each other, excited. ‘Great! A legendary one!’ The man dressed in a blue suit laughed. ‘Indeed, if we train her well, in ten years, she will definitely reach Yuan Dan level.’ Zhao Heng laughs. The young people under the platform looked at her with envy.